Because Powerstream is independent of a main hot water source, it can be installed in hard to reach locations. It is well designed with a safe lead-free construction. Powerstream is designed to produce low volumes of warm or hot water endlessly. We have 5 models to choose from. The model you select will depend on your desired water flow rates and desired water temperatures. 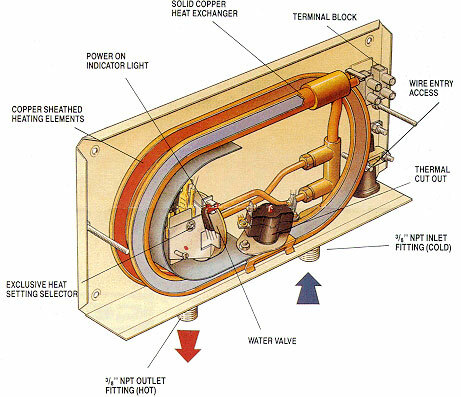 The Heater is constructed of two copper immersion heating elements with a solid copper heat exchanger, all contained within a UL approved ABS plastic housing. The chart below the cutaway provides some helpful facts to help select the right model for your needs.